Nice finisher's medal and "jungle gym" tech shirt. While this was by far the most difficult ultra marathon I'd ever participated in, as it turned out, getting there was even more challenging. I had everything planned out on my own in great detail. Flights, shuttles and accommodations were all researched online and only after reading multiple reviews did I book everything. I checked to make sure that both Anya's and my passport were still valid and I checked us in online before the night of our planned Thursday morning departure. Local running buddy and friend Richard Trice was kind enough to give Anya and I and our three duffle bags of donated running shoes and luggage a ride to the airport bright and early at 5:30AM. We knew we had plenty of time as we had already checked in and entered our passport info online and our flight wasn't leaving until 6:45 AM. All that was left to do was drop off our checked bags...or so I thought. Everything went along without any problems, our bags meet the size and weight requirements and we were handed our boarding passes. At that point, the Delta agent behind the counter reminded me that my German passport was expiring soon and I told her that I was aware and that I had already applied for a new one since I traveled a lot for business. I said that it didn't expire until next month, so I was good. This is when she hesitated to take a second look and realized that the German date displayed the day first and the month second and that her initial thought that my passport was still six months valid was wrong. "Oops", she said, "I can't let you board the flight to Nicaragua". "You must be joking." "No, Nicaragua requires your passport to be valid for six extra months". "What? Are you kidding?" This went back and forth to no avail. Anya was ready to cry. Her first vacation in over a year and I wasn't allowed to go. I had no choice but to call back Richard and to drive back home. I rebooked our flights for the next day in hopes that I would find a solution. When we arrived back home, I immediately called the German Consulate in Atlanta. I had ordered my new passport before Christmas and figured it would have to either already be there or be there shortly. After playing phone tag for almost 30 minutes, I finally talked to a staff member who informed me that my passport was actually laying in their mail outbox. "We were just about to call you to let you know that you can pick it up." Yeah, right! I guess bureaucracy is the same in any country and I'll just leave it at that. Anya and I got into my car to make the 4 hour drive to Atlanta, pick up my new passport, grab lunch and make the 4 hour drive back. In the end, I guess I was still kinda lucky. Im not sure what I could've done had my new passport not already been sitting in their outbox. My alarm went off at 4:30AM Friday morning. Once again, we headed to the local airport for the second time in 24 hours...a Groundhog Day moment for sure. But this time, there was no way I wasn't getting on that plane. We arrived in Atlanta and had a quick breakfast before heading to our gate. There was only one daily flight to Managua and we had no intentions of missing it. What happened next? You guessed it, "Sorry, ladies and gentlemen, the flight to Managua is delayed, because...blah, blah, blah." I couldn't believe it. Now we were in trouble. This delay would mean we'd miss the shuttle and subsequently the ferry to Ometepe island, unless we could get a different means of transportation and this is where I was officially introduced to race director Josue Stephens and his local "main man" Robinson. I called Josue to explain our predicament. He told me not to worry and that he'd take care of it. When we finally did arrive in Managua an hour late, Josue had arranged for a separate taxi to take us on the 2 hour drive to San Jorge, where we would get on the ferry to Ometepe...if we got there in time. The last ferry left at 5:30PM and there was a real chance we would not make it. Even chartered speed boats were mentioned when we discussed worst case scenarios. Fortunately, that costly last resort option never had to be considered. However, we did arrive too late to get to the pre-race dinner, even though Robinson had arranged for yet another taxi ride to our hotel and the dinner location. Thank you Josue and Robinson for making sure that I would actually get to toe the starting line at the Fuego Y Agua 100K. The view of Ometepe island from San Jorge. After a 2 hour ride in the taxi, we finally arrived in San Jorge. Now we just had to figure out what ferry to take and how to get tickets. I anxiously looked around, opened my Spanish phrase book and asked a couple seeming to wait for a ferry themselves. Using a couple of Spanish words ("Ometepe" and "Moyogalpa") and both my hands and feet, I finally figured out what ferry to take. We got our names on the passenger manifest and stepped on the ferry. One of the fleet of ferries taking travelers to Ometepe island. About an hour into the trip, a fare collector finally came around to charge us, 60 Cordobas (or just under 3 USD) per passenger, not bad at all for a 90 minute ferry ride. We arrived just before 7PM and the taxi arranged for us be Robinson was already waiting for us. After a very short shuttle ride (2 minutes) we arrived at the American Cafe and Hotel, where co-owner Bob was ready to show us to our rooms. After dropping our luggage off in our room, which was extremely nice, we headed up the street to get some food at a local pizzeria before I headed to the Fuego Y Agua race headquarters to meet Josue after he and his team had returned from the pre-race dinner. By now it was dark and other than a few tourists and a bunch of runners returning from the dinner didn't get to see much of this cozy little town of Moyogalpa. After a short and pleasant talk with Josue's wife Paula I received my race packet and returned to the pizzeria to finish my pizza and enjoy an ice cold bottle of Tona (favorite Nicaraguan beer, I liked it a lot;-) after which I headed back to the hotel to get my drop bag and running gear ready. By 9:30 PM, it was lights out to get some much needed rest after almost 2 days of travel before having to get up again at 2:45 AM. The race would start at 4 AM sharp and I wanted to make sure to get there by 3:30 AM for some coffee and friendly pre-race chatter. 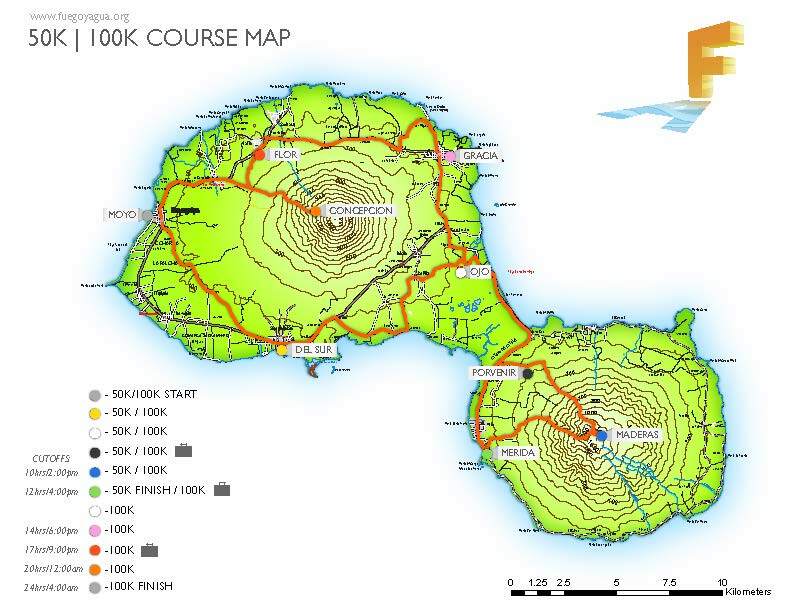 The Fuego Y Agua 100K ultra marathon takes place on the beautiful island of Ometepe in Nicaragua. The island is formed by two volcanoes rising from lake Nicaragua. It is the largest volcanic island inside a freshwater lake in the world measuring an area of 107 square miles (approx. 19 miles long and between 3 to six miles wide) with a population of around 30,000. The two volcanoes, Maderas and Conception, are joined by a low isthmus for form an island in the shape of an hourglass. The entire island is slated to be named an UNESCO Biosphere Preserve. 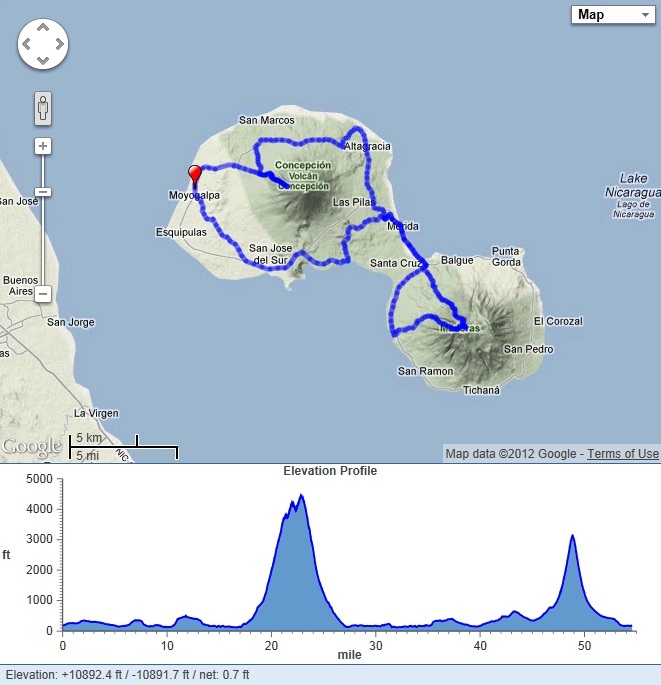 Thanks Wikipedia, I couldn't have said it better myself;-) The map below shows the island and the 100K race course. Christian and I both live in the Southeastern US and we've run in a couple of the same races. It's always great to see familiar faces at an ultra. After a 5 minute walk, we arrived at race headquarters and the location of the start and finish of the 100K and 25K distances. The 50K runners would finish half way through the 100k course at Hacienda Merida. Just as we arrived, Christian realized he had forgotten his race number (one of many things he'd forget through the course of the day;-) and headed back to the hotel to grab it. I proceeded to look around and grab a cup of coffee. Runners and spectators alike are eagerly awaiting the start of the race. As 4 AM approached, Josue directed us to assemble at the start line. Excitement was building quickly and when the clock struck 4AM, a couple of bottle rockets signaled the official start of the 2012 Fuego Y Agua 50K/100K races. Runners took off to the sounds of their own howling, shouting and whistling (yours truly included) and made their way down the main street of Moyogalpa until making a left turn onto the first section of trail after less than a quarter mile. While most of us runners and other non-locals would call the majority of the sections we ran that day "trails", locals would probably consider them "roads" necessary for their daily commuting to and from work or school, often via motor cycle or bus. Trucks would use them to transport local crops like bananas and plantains and farmers and ranchers would use them for herding their life stock, which ranged from cattle and goats to horses and donkeys. Third row, white shirt, white hat, yep, that's me. While we were basically on our own for the first hour of our race, very soon after and while it was still pitch black outside, the island would come to life. I would notice whole families walking down the trails, motor cyclists would stop here and there to pick up fellow islanders from their homes and farmers would start tending to their lands, feeding their life stock or cutting the produce on their fields. One of the road sections early in the AM. I reached the first check point and aid station "Del Sur" in just under an hour. I received my first of 9 bracelets I needed to collect and continued on. I had completed the first 6 miles and I was feeling great. I was running with my CamelBak Octane XCT to allow me to carry some emergency necessities as well as up to 3 liters of water. I usually trun every ultra just with a couple of handbottles, but I had been training with this new pack for the last two months just to get used to the weight and to make sure it wouldn't bother me on race day. Since I had filled up at the start, I wasn't really in need of any additional water just yet. At this point, I was already running pretty much on my own, noticing a couple of headlamps ahead of me and behind me. We were now running on a short stretch of paced road and I had settled into a nice and easy pace. Every time I felt an incline, I slowed down to a walk. It was my goal to walk every single hill or incline and to run everything else. I knew it would be a very long day and as Christian had reminded me at the start, you did not want to "go all in" early in this race. About a mile after leaving "Del Sur", we were once again directed to turn right and onto another trail section. I recall this section to be fairly downhill initially before leveling out again. It was during this stretch of trail that I briefly saw Christian before he continued on ahead. I knew of his "A" goal (<16 hours) for this race and figured it would be a good idea for me to be behind him anyway since mine was <20 hours. Before long, his headlamp disappeared on the horizon. As daybreak approached the race course directed us onto a beach at the isthmus of the island, were we would run for maybe half a mile before being directed to make a sharp left turn onto a trail leading away from the beach. As I made my turn I noticed a couple of runners at the beach way ahead in the distance. I started to yell and whistle to no avail. As I found out later, quite a few runners including Christian missed this turn and had to backtrack to get back on course. I took this opportunity to double check a copy of the course map I had brought along, just to be safe. During this stretch, I was once again passed by a couple of runners, Chris Hall and Mark Connolly, as we ran through a banana plantation. Shortly before that, Christian caught up to me as well. He was indeed one of the runners who missed the turn. He must have really turned on the after burner because I really didn't slow down that much, yet he managed to catch up to me fairly quickly even after having run some extra mileage. The scenery of this place continued to strike me with awe. The people, the wildlife, the plants, just amazing. The picture below shows one of those banana plantations as we ran through it. 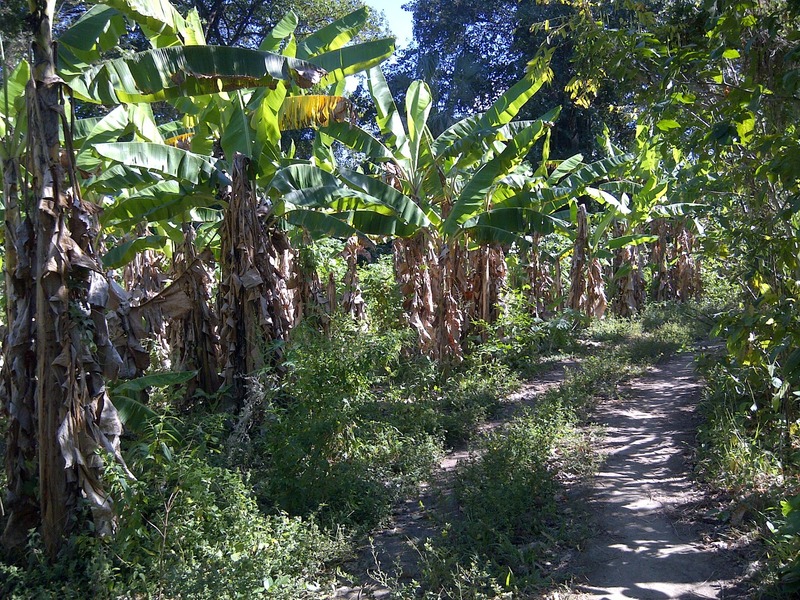 One of many banana & plantain fields we ran through. My face tells the story, I haven't climbed a volcano, yet. As we exited the aid station, we knew the next check point in six miles would be at the bottom of volcano Maderas, the first major challenge of the race. We would need to fill up on food and water before heading up the volcano. As we entered the main road on the isthmus connecting the two volcanoes, we saw Maderas rising in front of us. As we got closer, it got bigger, but it really didn't matter. It scared the crap out of me as soon as I saw it. I kept saying to myself, "what? I'm supposed to run up that? No way! No seriously, no way!" Well, I thought I was just saying it to myself but apparently I wasn't as Christian heard me. We kept talking about the volcanoes and how we still had to climb both of them. Oh well, I just tried to pulled the lid of my hat low enough so I wouldn't have to see the volcano on the horizon. I told Christian I was just trying to keep the sun out of my eyes, but really, I mostly wanted to keep the imposing volcanoes out of my sight until it was time to climb 'em. Other than being intimidated by the volcanoes I was still in great spirits. Christian and I maintained an easy pace in the hopes that it would allow us to stay steady for the entire race. Christian knew what was coming as he had been here before. Just before mile 20 we arrived at the "Porvenir" aid station at the bottom of volcano Maderas to receive our third bracelet and much needed nutrition. While I was feeling good physically, food was already stopping to appeal to me. I filled up my bladder, grabbed a couple of Honey Stinger blocks and a waffle and went on my way. We turned left and immediately started climbing, not too steep at all, just a steady incline. It was a very technical rocky section, but it wasn't too bad. For a brief moment I started to think, okay, this isn't too bad. I can't run it, but it won't kill me. I'm glad I didn't say it out loud this time as Christian would have started laughing hysterically. I was way off. When we actually started to climb, the previous section seemed like a downhill run. Christian and I climbing the "easy" section of Maderas. The next 10 miles would pose some of the toughest terrain I'd ever experienced in my life. We would have to climb 5 miles straight up, then drop into the crater of the volcano to retrieve our fourth bracelet, before climbing back out of the crater, climbing through the "jungle gym" section along the ridge and heading back down some seriously steep trails to the bottom of the volcano. Christian and I continued to climb and the terrain got steeper once more. When we finally reached a clearing, I spotted a bench (the only bench on any of the volcanoes) and gladly sank into it for a brief moment. Christian joined me for a quick breather. And then I made the mistake of asking "how much further?" "Ha! We're not even a third of the way there." Oh man, that was deflating. And up we went some more. I decided to put my head down once again and just keep going. When I reached the ridge, I no longer spotted Christian behind me. We had both started to have a bout with nausea on our way up. We were craving fluids but felt like we couldn't drink any more. As I continued my climb, it slowly went away. I took some additional SCaps as my fingers started to swell ever so slightly and I needed to make sure to keep my electrolytes and fluids in balance. It was still going to be a very long day and struggling with nutrition this early on could mean big trouble later on in the day. I decided to keep going as I was certain that Christian would catch me on the way down. The downhill section into the crater was both murderous and fun. It was very steep, very muddy and very slippery with barely anything to hang on to on your way down, but I eventually made it to the lagoon inside the crater. What a relief to see the volunteers that manned this aid station. I don't think there is another ultra in the world that has an aid station inside a volcanic crater. I filled up my hydration bladder, chatted with the volunteers, washed my hands in the small lake and treated myself to some bread with Nutella. For those of you who do not know Nutella, it is a chocolate hazelnut spread that I would consider to be as popular in Europe and other places as peanut butter is in the US. Truth be told, I grew up on that stuff in Germany and I love it to this day. There is nothing better;-) After reminiscing for a moment, I grabbed my stuff and headed back out on the course. This next section was just as challenging as the last 5 miles, but a lot different. We would crawl along an exposed section of "slick rock" with really no trail to speak of, but we had to make our way across this section anyway. The blue markers indicated as much. Sometimes, there was really no way to go, except you would notice a marker a short distance ahead and you knew, dang I am supposed to go this way, but there is nowhere to go. That's how it felt numerous times during this section. Once I made it across this part I started to climb out of the crater and onto the ridge. This section is probably the most famous section of the entire race. It's referred to as the "jungle gym" for good reason. This was not only the rootiest section (is that even a word?) but also the muddiest section of the day. I passed another runner who appeared to still be trying, in vain, to keep his feet dry. I had long given up on that. As I passed him I took a step across a big log and as my foot made contact with what I assumed to be the ground, it just kept sinking and sinking in mud, until it reached just below my knee. Wow, this was insane! Oh heck, I just started to enjoy it. I used to love this as a kid, now I got to do it again, how cool is that? As I continued to wade through the mud, the roots became thicker and thicker and the term "walking" no longer described what I was doing. I was now in full on scramble mode. I was scrambling and climbing through the roots, sucking in my gut to squeeze through roots, using both hands and feet to make it another foot ahead. This was cool. I continued to slowly make my way along the ridge. I remember looking down at one point while climbing on some massive roots only to see no ground below me, nothing, nada, other than some tree roots that were stretching across this massive gap in the ridge. At this point you just stop thinking "what if" and you keep going. This was no longer an ultra marathon, this was an all out adventure. It wasn't a race, I just wasn't moving fast enough to call it a race at this point, it was a good old adventure. Once I completed this section, it was time to make my way down the volcano. I slowly started heading down the volcano. It was as steep down as it was up and I had not figured out yet how to get down. I literally had to head down almost as slowly as I climbed up. There were sections so steep, I wasn't sure how to get down. My legs, although not short by any means, seemed too short to reach down and there was nothing to hold on to. This happened multiple times. Other times, I just tried to literally swing from tree to tree. I would dive for the next tree downhill and grab it with one hand, using my forward momentum to swing me down towards the next tree, and so on. It was crazy. Apparently, Christian was doing slightly better than me as he caught me about half way down the mountain. We caught up on each others' misfortunes going up and down Maderas and reached the Hacienda "Merida" aid station that served as both the finish line for the 50K runners as well as themidway check point for the 100K runners, handing out the fifth armband. Because all but one of our collected bracelets had lost their adhesive properties, the volunteers had started to tie the other armbands to the single sticky one, creating these big multi-colored bushels on our wrists, making them look like the sleeves on a jester outfit. Once we arrived, we quickly grabbed our drop bags and sat down in a couple of chairs. There were about 4 or 5 runners that had just completed the 50K distance and were done. 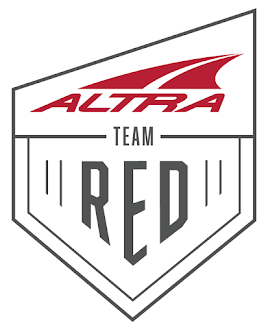 Some of them cut their 100K races short, others had planned to do 50k from the beginning. Elated to have completed the first half of the race. First, I took off my filthy shoes, socks and shirt as well as my ankle brace. I replaced all of them with clean items except my ankle brace which I had to reuse. I didn't have any blisters at this point, but after looking at my feet, I realized that the continued exposure of my feet to mud and their literal submersion in mud during the Maderas ascent and descend had made them extremely prune. Blisters seemed only to be a matter of time, but I wanted to prolong it as much as possible through proper care. I borrowed some wet wipes from Christian to clean them and used an old towel to rub them as dry as possible before putting on my new socks. This was our longest stop by far, but I wanted to ensure proper care now to avoid problems later. Running through a "cow pasture". We left the aid station around 1:00 PM, just 9 hours after starting the race. We were about to experience another tough section, 8 miles of fairly flat road/trail along the isthmus in the hot midday sun without the hint of a breeze. It was hot. Christian and I quickly adopted a run/walk rhythm, run from one light pole to the next followed by a walk to the following pole and so on to try to keep a steady pace without exerting ourselves completely. After a couple of miles we stopped by a little kiosk on the side of the road to buy a couple of ice cold Coca-Colas. It was heaven. Within less than a minute I had gulped down the entire 20 oz bottle. But do we "look" slow? While the cokes gave us a boost, we did continue to keep a slow and steady pace. The sun wouldn't let up and we couldn't catch a breeze to save our lives. CFM became my mantra. I wasn't moving fast, but I was moving and that's all that matters to make it to the finish line. That and beating the cutoffs, of course;-) Running with Christian made the time go by much faster and before I knew it, we had arrived once again at the Ojo check point to collect our sixth armband. Again, we saw more people just hanging out and enjoying the water and the lounge chairs either to take a break or to call it quits for the day. Christian and I refueled and kept on moving. 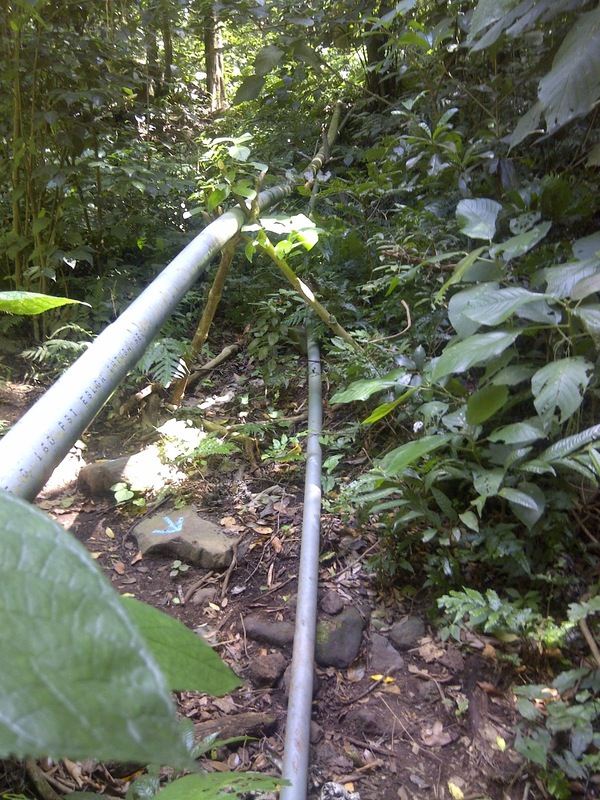 Next we headed 5 miles to Altagracia to collect yet another bracelet. By the time we made our way into Altagracia and the Gracia aid station, we had caught up to a couple of other runners. This aid station was in the middle of town next to a little park. The entire way from the last aid station, volcano Conception had been looming above us and this would continue as soon as we headed out of this aid station and town. I kept peeking to my left, only to see Conception still there. However, we never actually headed for it. Instead, we continued to circumvent it, keeping it on our left the entire time on our way to the La Flor check point, our final stop before climbing volcano Conception. It seemed like this section prior to the Flor aid station was our slowest section yet. However, when we arrived at the Flor aid station, my spirits were lifted immediately. They had pizza...and some coke! Score! Christian and I sat down one last time to recharge before the last climb. We met up with Frenchman Stephane at this stop and we all decided to start the climb up Conception together. The sun was going down rather quickly and after we all put on our headlamps, Christian realized that his was just about dead, with no spare batteries in sight. Oops. As we approached Conception his lamp got dimmer and dimmer, not a good thing just before you're about to climb up a volcano. Just as I decided to take the lead and to keep Christian between myself and Stephane, we saw another group of volunteers (members of the Managua Runners Club, I think) who were posted at one of the course intersections to direct us. Luckily, one of them was kind enough to lend Christian her headlamp. We were good to go. Just around this time, something that has never happened to me in almost 30 ultras happened, I got a second wind. I started to feel great. As I continued my steady climb, I was already starting to think of how I was gonna run after I got off this mountain. I was "smelling the barn" as Christian put it. I continued my steady climb and before I knew it, I had reached the final check point before the finish line atop of volcano Conception (well not really atop but pretty far up anyway). There were some really strong winds up here and literally no protection from it. This section of the volcano was bare with just a little grassy ground cover and we had to climb to the next tree line to get to the aid station. I felt sorry for the local volunteers, who had been huddled up here for quite some time. I got my ninth and final bracelet before grabbing some potato chips and some water and turning around. And the craziest thing started to happen, I started to run. Yes, I ran down the steep volcano trails. Shortly after leaving the aid station Christian had made his way up and I was certain he was going to catch up to me again on the way down. I continued to feel great, so I continued to run. I stumbled, I got bitten by ants, I saw a scorpion, I stumbled again, and again. But I was still running and still feeling great. Im sure it felt faster than I actually ran, but I didn't care. I was going to continue to push steadily to the finish. After I reached the bottom of the volcano, I started to look for markers and as the markers became sparse and sparser, I started to question myself and my sense of direction. After I made my final turn towards Moyogalpa, I started to ask the locals along the side of the road for the way to Moyogalpa. They confirmed my direction. Before I knew it, two volunteers on a scooter passed me, asking how I felt and telling me that I had just 2K to go. That couldn't be right, could it? I had only been running a little under 17 hours at this point. I was sure I was barely gonna make my 20 hour goal. Yet here i was, about to finish thins thing in a little under 17.5 hours. As I entered the town, some tourists and locals started cheering me on. In the distance, I could see the finish line and hear the crew of volunteers and runners shouting and cheering. It was awesome! I had made it. Elated, I received my finishers medal and a nice cold 40 oz bottle of Tona beer. Heaven. The GPS data from my Garmin Forerunner 310XT. The most rewarding activity during this entire weekend was the 5K race on Sunday morning, the day following the 25K/50/100K races. This event is hosted by Natural Doctors International and supported by Fuego Y Agua for the local kids free of charge. RD Josue had asked runners to ask their local communities for running shoe donations in order to enable them to give every participating child a free pair of running shoes. All of us runners and sponsors responded and by the time the race started at 9AM on Sunday morning, every single one of the almost 400 kids had a free pair of shoes. Other sponsors had also stepped up to provide a free t-shirt and a medal for every finisher. Anya and I decided to participate in the event by volunteering to run the second aid station on this point to point (town to town) 5K race course. After setting up shop around the 3K marker, we anxiously awaited the kids. The picture below shows Anya at our aid station just before the race started. We might have been short a few hundred cups, but we were ready. The race leader just before the aid station madness ensued. After it was all said and done, we had managed to provide water to 400 kids. We packed up the gear and waited for our ride. A little while later, we saw Christian and other volunteers from the other aid stations making their way up the streets carrying the tables and coolers on their ay back to race headquarters. So we decided to do the same and packed up shop. This was probably one of the most rewarding things I had done in a very long time. After we collected our last drop bags and other belongings from race headquarters, we got on the race shuttle that would take us to Charco Verde for our post race luncheon. When we stepped off the shuttle, we had yet another amazing view of volcano conception. I got to enjoy a great lunch with my fellow racers before taking the shuttle back to town. Once we checked out of the American Hotel and Cafe (which had been a great home base for us before, during and after the race) and said our goodbyes to owners and most fantastic hosts Simone and Bob, we took a 4-wheel taxi ride to our next destination, a remote little Bamboo cabin on the side of volcano Maderas at the beautiful Totoco Ecolodge resort. After getting pampered by Simone's and enjoying her home cooked food at the American Cafe, this was the perfect spot for some much needed R&R for both Anya and I. Luckily, the food at this place was amazing as well and we got to relax at the bamboo bar at the main lodge or poolside overlooking volcano Conception. Before we knew it, it was time to head back to the States. I am sure next year's event will be just as exciting as this year and I can't wait to pack my bags to once again head to Isla de Ometepe for another wonderful adventure. The view from our dinner table at the lodge. Wow. Great recap of a great adventure! Great read Martin! This will give me inspiration for my first 50 miler. I really liked the part when you got your second wind. I live for the second wind. I hope I get one this Saturday. Good Luck on your upcoming 100 miler. Wow Martin! Sounds like an incredible race. Congrats on yet another ultra under your belt. Nice race Martin! Isn't it awesome to get that "second wind" and finish a race strong like that? Awesome! This one is definitely on the bucket list. Now just chill and rest for Double Top, you are more than ready. Good luck! @Rob, thanks very much, I sure hope so. Congrats on your Bushwacking adventure. Not sure where that was, just saw the pic on FB. Regarding DT100, while I feel ready, the weather doesn't look very promising at all right now. The Bushwhacker Johnston Marathon (BJM) is an annual tradition. Essentially run from the top of Monte Sano Mtn. to the Tennessee River (Ditto Landing) with as little pavement as possible. Therefore a huge chunk of the route is pure XC through the woods on no trails. Quite EPIC! This year was especially tough as we reversed direction, changed the route some to include more XC and made it about 28 miles. Next year will be even better (it always is). @Ryan, thanks man. You should join me some time! @Jason, thanks buddy. When are you going to join us for a training run again? Congrats again on your first 25K trail race at Black Warrior, way to rock it! @Rob, wow. I had read about circumventing Huntsville entirely on mountains in an older HTC newsletter a while back and my running buddy Rich and his brother Mike had actually done the run you describe once before. Hopefully, I'll get the opportunity to run/bushwack that way some day. Great blog... I thought I was the only one who carbed up on pizza. After reading your comments I gave Nutella a try... It is really good. I am registered for McKay and thinking about Strolling Jim. Maybe I will see you at McKay. Keep up the great race reports.